Find out what Xur is selling for November 10, 2017, Week 10. It’s Xur day, Xur day, gotta get down on Xur day! Despite many Destiny 2 players already owning the vast majority of Exotic weapons and armor, Xur’s arrival is still heralded as an exciting moment in players’ lives. 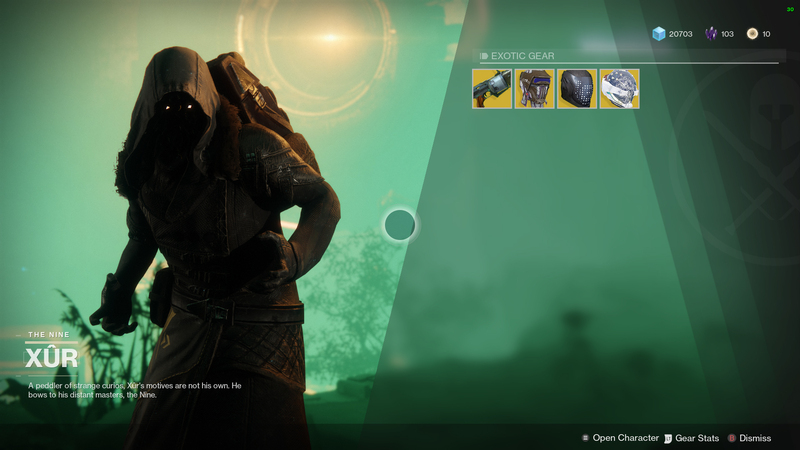 This is the second week that PC players will get an opportunity to check out Xur’s wares and see if he’s selling anything that tickles their fancy. As always, be sure to bring along a good supply of Legendary Shards in case you want to buy everything. Here’s what the tentacle-faced Agent of the Nine is selling this week. Finding Xur is no longer a matter of hide and seek, you now know exactly where he is by looking at the Director and inspecting each of the planets. This week, Xur can be found on Nessus, in the Watcher's Grave, up a tree. No one will be surprised to hear that Xur is selling a weapon and three pieces of armor. Each piece of armor will set you back 23 Legendary Shards while the Exotic weapon costs 29 Legendary Shards. If you’re still looking to level up fast in Destiny 2, purchasing gear from Xur is a great way of breaking through the 265 Power soft cap. If you have the Legendary Shards, you should purchase everything not nailed to the floor – you never know when an Exotic Rocket Launcher turns out to be the strongest weapon in the game. However, if you’re running low on Legendary Shards, absolutely always buy the weapon, and then just grab a piece of gear for your preferred Class, provided you don’t already have it. Once all that’s said and done, take a look at our Destiny 2 Complete Strategy Guide for more information, tips, and hints. You’ll find guides on every single activity in the game, both PVE and PVP.